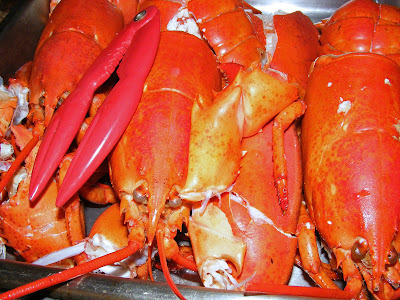 We love campfire cooking and had some fabulous meals while we were tenting it in Maine. 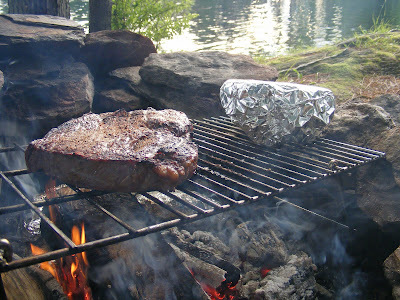 The Kitchen Genius loves campfire steak best so that was a must have dinner along with salt encrusted potatoes wrapped in foil and cooked in the coals. The firepit was just a few feet from the lake so our "kitchen" view was pretty awesome. 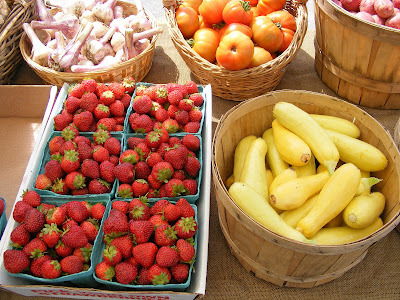 The town of Winthrop where we stayed has a twice a week farmers market. Cooler space was at a premium so I restrained myself to ingredients for a nice salad and a loaf of homemade bread (heating up in foil over the fire above). 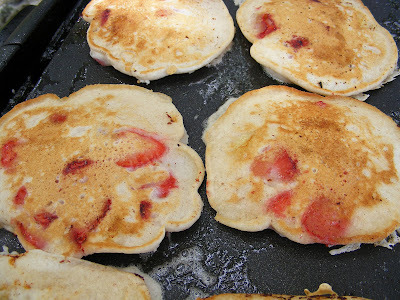 I bought some strawberries for snacking that made their way into some yummy strawberry banana pancakes for breakfast. Of course the boys had to have bacon and we actually had electricity at this campground so we brought our electric griddle. It was so convenient we cooked breakfast several days instead of just eating cereal like we usually do. We didn't rough it every night. My brother Scott and his wife Shayna invited us over to their house for dinner and my step-father Tom sprang for lobsters. Despite a violent thunderstorm and the torrential rain that began the second the food was ready to eat, we had quite a feast. KG had a hankering for mussels so he cooked up six pounds of his Dijon mussels. 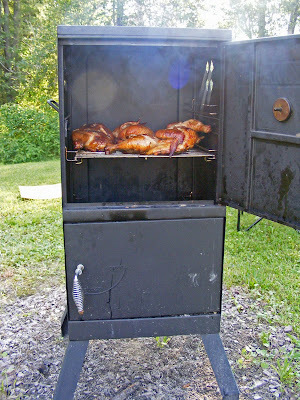 My brother Scottie fired up his smoker to cook two whole chickens for my kids who don't like seafood. I want a smoker of my own now. Because it's not only fun, but the chicken was DELICIOUS! 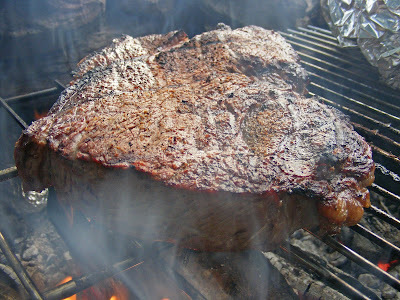 It was tender, juicy and smokey from an internal campfire. Pretty cool. 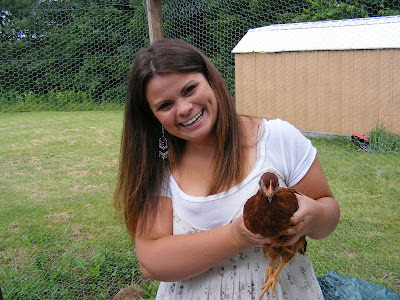 Scott and Shayna got chickens about three weeks after we did. They chose Rhode Island Reds. Aren't these two girls beautiful? There's nothing like breakfast cooked on a campfire. Mmmm! Looks like you had a delicious time... lots of yummy foods. 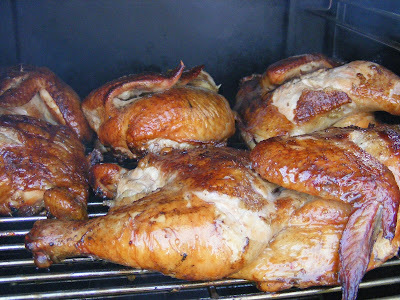 Smoked chicken is one of my favorites... you just have to taste it to believe how good it is! Wow - you have been feasting! It all looks wonderful. I believe this just convinced me to try camping. Such gourmet eats for camping! How delicious! 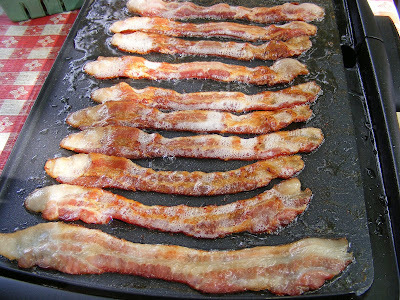 There is something wonderful about smelling woodsmoke and frying bacon on a crisp morning at camp. 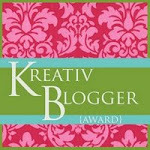 Love the pics. I'd still love to see you too...we are driving back to California on August 1st (so sad), so maybe we can make it work sometime next week? It sounds like you really enjoyed yourself! The food looks awesome! I can't wait to go camping this weekend - I love cooking on the campfire. Everything looks tasty - especially the pancakes. I am obsessed with mussels/clams. Once I learned how to cook them, I couldn't believe how fantastically easy they are. 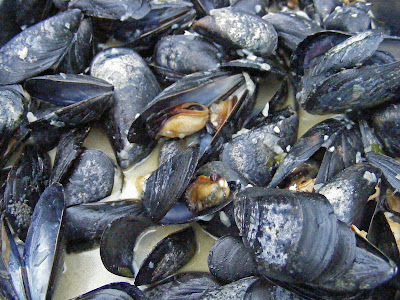 I am bookmarking the dijon mussels recipe- I HAVE to make those! Wow, looks like a great trip! All that wonderful food looks beautiful too! So colorful!